Interested in how Artificial Intelligence might impact your business? Join us March 27th for a morning workshop to hear made-in-Alberta success stories and learn about what’s next in AI. Seating is limited; attend in person at SAIT or via webcast. Left to right: Laura Kilcrease, CEO of Alberta Innovates; Stuart Kinnear, co-founder of Interface Fluidics; Dr. Lori J. West, University of Alberta; Dr. Christopher Clarkson, University of Calgary; Minister Deron Bilous, Economic Development and Trade. Rick Tofani, Director of Applied Research and Innovation Services at SAIT and ASTech Foundation Board Chair, introducing the Humans of Alberta Innovation series at the 2018 INVENTURE$ conference. The ASTech Awards have a new twist in 2018! In keeping with the spirit of inspiring innovation, the Award program was redesigned to better reflect the work and accomplishments that drive the economy in Alberta and across Canada. Two awards were reconfigured and one new award was added to the lineup. – The Science award has become Outstanding Achievement in Science and Engineering to reflect the importance of engineering activities in our daily lives. – The Oil Sands Research Award has become the Outstanding Achievement in Energy and Environmental Innovation Award sponsored by Syncrude Canada Ltd. to capture the breadth and depth of achievement in the energy industry. – The Health Innovation Award has been added to honour leadership in the health and medical fields. In total, 10 awards will be presented in October, representing outstanding achievement in science and technology across the innovation spectrum. 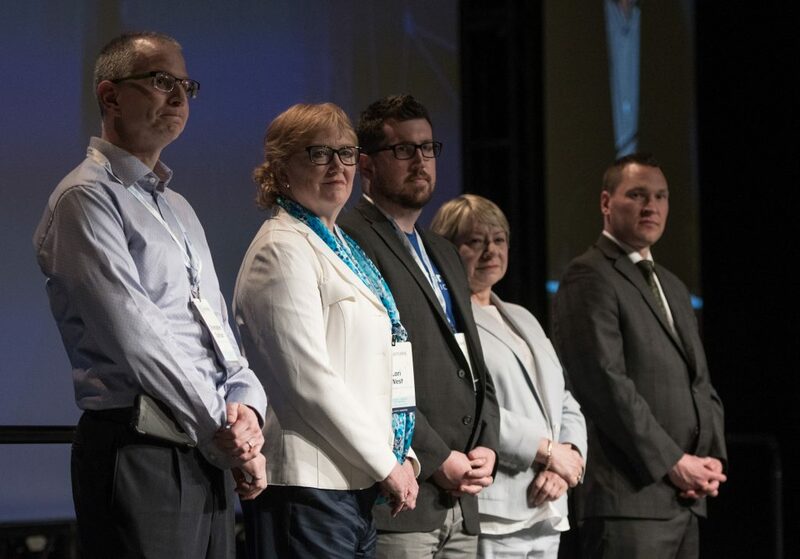 – Core Awards (6): Science and Engineering; Technology; Applied Technology(sponsored by SAIT); Start-Up, Commercial Achievement; Leader of Tomorrow(sponsored by Alberta Economic Development and Trade). – Sector Awards (4): Agricultural Innovation (sponsored by Dow AgroSciences Canada); Energy and Environmental Innovation (sponsored by Syncrude Canada Ltd.); Health Innovation; and Information and Communications Technology(sponsored by TELUS). Alberta’s innovation awards, the ASTech Awards, are now accepting nominations in 10 categories. Awards will be announced October 26, 2018 in Edmonton. 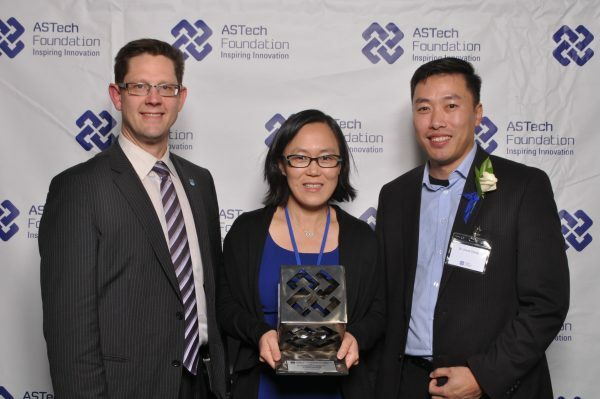 By becoming an ASTech Award Winner, you and your organization will join the ranks of over 500 high achievers in th e science and technology innovation ecosystem recognized for their leadership in Alberta since 1989. Five sponsored awards also include a cash prize of $10,000. 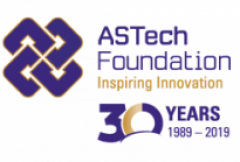 Nominations for the 2018 ASTech Awards close May 31st. Nominations are subject to third-party adjudication by a panel of industry experts who select Winners and Finalists that exceed the strict criteria for each award. Learn more about the awards here. To submit a nomination, click here. 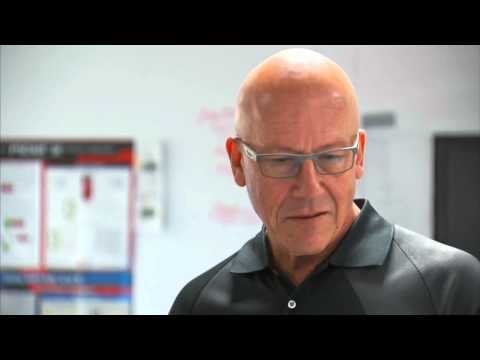 Take a look at the people behind the research, product, company or groundbreaking discovery. The ASTech Foundation’s Humans of Alberta Innovation campaign shows a new side to Alberta’s fascinating innovation community — the human one. Dr. Ryan Tucker is the 2015 Leaders of Tomorrow Winner for leading an applied research team that helps create and take new products to market for environmental protection, water treatment, and sustainable construction. It’s all about trying to make an opportunity for yourself in whatever situation you’re in. Growing up I was much like many kids where I wanted to be a fireman, or an architect. Understanding what a career is when you’re young, it’s a wacky thing, especially for those still in school. I’ve always enjoyed science and technology. I was interested in how things work and what goes into making things operate. Even as a kid I would always take things apart around the house and I was really fascinated with the concept of inventing something. My fascination with how things work got me interested in science and technology. The next part was opportunity. It’s all about finding out what opportunities exist and working towards them. Once I got to university, I realized I actually had some skill at this and there were some things I could do to have a career in science and technology. Innovation is happening globally and I’ll always try to find a spot to become a part of it. It’s everywhere; it’s the only thing that’s going to make my children’s lives different than my own. My new gauge of success is how can my work have a positive impact on a larger number of people? I had the opportunity to live in the Netherlands to work in science, which was really cool. On the weekends, I had a motorcycle so having the freedom to roam around and time do to it was the greatest blessing. I really valued that. When I travel, whether it be for work or pleasure, anywhere I can find a science centre or technology museum, you’ll find me there. In terms of experimental infrastructure and research infrastructure, we have a lot of great facilities in Alberta. On the education front, we train good scientists, engineers and technologists. There are some companies that are truly innovating on a global scale, but we need more. Being ready to try to move towards a global level of innovation is something they should be ready to do. 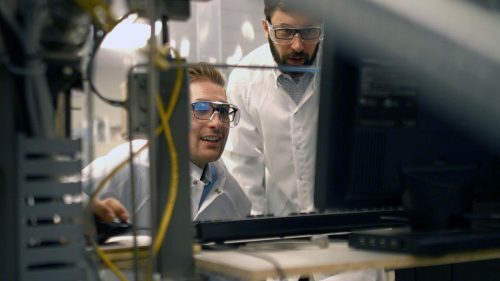 The first job you get may not be working for NASA, or actually working at the forefront of science and technology, but there’s an opportunity over your career to bring what you’re working on closer to true innovation. I had job offers that I chose not to take because I wanted to stay in Alberta. There’s a big opportunity here to take the time to progress our industry and broaden the spectrum. Our universities are great and I think it’s worthwhile to stay and try to push the envelope. Any young innovator who’s starting their career in Alberta should seek out those who also find value in staying and building something here. It’s not going to happen in one company or with one person; it’s a group of people within a vast industry that strive for success. It’s all about trying to make an opportunity for yourself in whatever situation you’re in. I’ve always been interested in working in the energy and water sectors; they’re becoming the biggest technological issues in this generation. I’m in the early stages of a project right now working with another company and the University of Alberta. We’re using world-class technology from the industrial side and academic side for water treatment. It will be really exciting to see how far we can advance the technology in the next few years. Going from how technology works in a lab to implementing it in real life situations is the most interesting part of innovation for me. Seeing eyes light up as eager Grade 3 students learn about material properties and engineering principles is what it’s all about for the Alberta Science Network’s Scientists and Engineers-in-the-Classroom program. 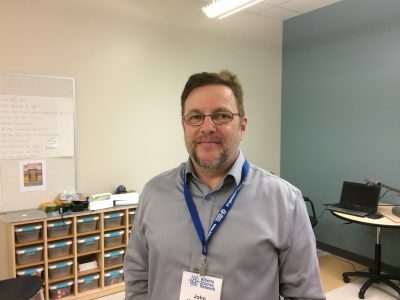 John Whitbread, P. Eng, an electrical engineer at General Dynamics, made engineering fun and practical recently during a presentation to the young students at Calgary’s West Springs School. 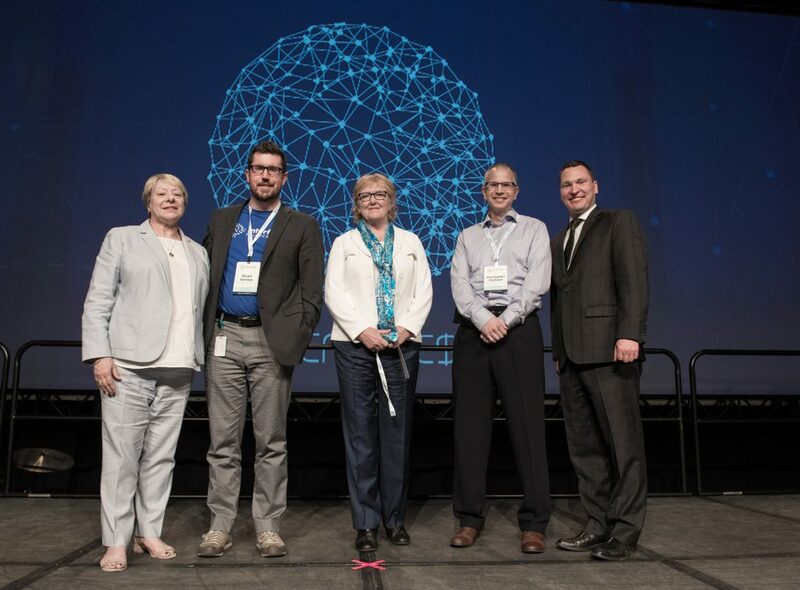 Alberta Science Network (ASN) was awarded the 2016 ASTech Excellence in Science and Technology Public Awareness Award. From teaching the basics of the material properties of common building materials to testing the strongest shapes for a paper structure, Whitbread guided the class from what they knew to what they could do with their new knowledge. Given the task to support a book 12-inches off the table using only paper and tape, the students jumped at the opportunity to use fundamental engineering principles of design and testing to create structures out of the flimsy paper. Just as in everyday engineering, sometimes through testing the designs needed to be changed. As the students constructed their paper structures to support the weight of a textbook, a few students realized what they had planned on paper wasn’t going to work in practice. Despite the obstacles, the students were undeterred. From the paper that crumpled, new sturdier cylinder supports were formed. The key, for Whitbread, is to engage the students with enthusiasm, know when to move from discussion to the fun of building, and let the students and teacher support the guided presentation. “Most importantly, bring the topic down to their level,” Whitbread added. Whitbread said the most rewarding moment as a volunteer comes when he sees a student really enjoying the experience. Through the different ASN programs, over 65 000 students per year participated in hands-on learning with experts across the province. “More than any organization I’ve worked with, ASN provides both the guidance and the freedom to create opportunities for those moments to happen. When a student turns to me and says, ‘I love this!’ or ‘this is the best day of school ever!’, I know I’m participating in something very worthwhile,” said Whitbread. For the teachers, it is invaluable to have an expert from the field enter the classroom and demonstrate the real-world application of the lessons they teach. The goal of the ASN program is to make science, technology, engineering, and mathematics (STEM) both hands-on and expert driven. The teachers said the expertise an engineer brings to the classroom provides the opportunity for engaging and authentic learning for both the teachers and the students, who are filled with questions and eager to further explore the concepts. Thanks to the work of professional volunteers like Whitbread, ASN is helping inspire young minds to engage in STEM learning and appreciate careers in STEM. Allan Chegus is the president and CEO of 2015 Stream Systems Ltd., which won the 2016 Outstanding Science and Technology Start-up Award. Stream Systems’ technology identifies and solves optimization issues by replacing expensive custom models with a business solution that can be created five to ten times faster than the models. Back in the ‘80s when I started working in oil and gas, it was very rudimentary. PCs were just coming in, it was simple stuff. Data was scattered and incomplete. I did a lot of operational engineering work, and I got into controls engineering and control systems. We started looking at the logic behind how the systems worked. And I got really interested; this is very cool stuff! I became a consultant later in my career and soon realized that organizations weren’t thinking about or solving problems in a holistic way. Decisions were siloed within groups or departments, rather than with the understanding of how it would impact the organization as a whole. I realized that what was needed was the application of systems thinking to understand operational networks differently. And, this needed to be done in a way that facilitated experimentation to arrive at the best outcome. What I imagined was a creative tool that enabled the user to see how operational decisions impacted networks as a system, but that also allowed them to experiment with new ways of operating. The technology couldn’t support the ideas yet, but we could conceive it, understand it and think about how it might work. Today, the tool and technology have reached convergence with the need because we have so much capacity and speed. So now it’s limited by our creativity. How do we put the algorithms and the software together to replicate the real world? This is why modelling is so important. The technology at Stream Systems takes our collective experiences and puts it together with algorithms and systems that make sense. It’s a single model for finance, operational, environmental, human behaviour, business rules and quality information. Then you throw scenarios at it to understand if we run this scenario, how does it impact the entire organization? It takes away from individual understanding and creates a cohesive, collective understanding. Getting access to information is important; getting access to information in real time is crucial. The human will always make the final call, but the machine is great at crunching a lot of information to identify all the alternatives. As the world gets more connected and more complex, we need tools to help us understand what is even possible. As humans, we need to understand how to deal with that complexity. Our brains are wired for pattern recognition, not data crunching. Our world is a series of systems. Systems thinking is becoming more prevalent, and it’s driven through our education system. At engineering school, I learned to decompose the problem, get it down to its elements, and solve those problems. The assumption was when you add it all up again, it solves all the problems, but I realized it didn’t. I know if we shift technology to a systems-based approach, then each system is impacting part of the bigger picture. Since we started Stream Systems, my world has completely changed. As an entrepreneur, I am consumed by my work; it becomes everything you are and everything you do. It’s also opened my eyes to what’s really possible. I look back on the concept now and it was so limited. Now I see it’s only limited by imagination. We are now solving problems with Stream that industries have grappled with for decades, and we are solving them on almost a weekly basis. That’s how revolutionary this is. I’m trying to get people to understand anything is possible, but the biggest challenge is disbelief. Change is difficult. When we started Stream, it was about changing oil and gas, and then we realized it was about transforming human thinking. Very philosophical, but not very practical. So, we said let’s create software to show people how this can be applied. That lead us into mining, mass transit, the power grid and hard-to-decipher government policies. These are all examples of systems thinking. So here we are in Calgary, with our little company, 18-20 people. We do expect to scale up quite quickly, and we expect to go far beyond Calgary. It’s all based on ‘Let’s take this philosophy to the world, and help the world be a better place.’ Sometimes it doesn’t go as fast as you’d like. The real world meets your desire with limited resources. If you think you’ve got a better idea, pursue it. As Canadians, we don’t have enough entrepreneurs. We have smart people and the physical resources, so what is holding us back? It’s our willingness to take risks, to be the first. That’s what we should believe as a Canadian culture. Take a leap of faith. 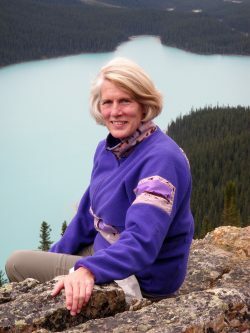 Kim Sturgess won the 2015 Outstanding Contribution to Alberta Science and Technology Community Award for her work as CEO of Alberta WaterSMART. Through the company’s projects, she makes it her business to know how to effectively manage water across a wide range of scenarios. Always default to curiosity. Water is one of the most fascinating and mysterious molecules in the universe, not to mention being essential to life here on earth. People in the water industry usually have a passion for spending time by lakes and rivers and oceans. I grew up beside lakes and moved to PEI, living beside the ocean. Today I’m near Alberta’s majestic rivers, lakes and glaciers. This will be my 27th year camping beside the mighty Athabasca River for our summer vacation, and water is a big part of my life. I’ve always spent time wondering, and I’ve always been interested in the environmental side of business and engineering. How we view water in a sustainable economy became a passion, as did bringing environmental and business challenges together and managing them as one. I look at myself as a simplifier. At WaterSMART Solutions we like everyone to understand. We create and share tools to enable constructive conversations to take place. Some of our most important work is getting people on the same page, through a shared understanding, rather than arguing facts. This is when you can build a constructive conversation, where people truly share differences on issues, be it through values or perspectives or knowledge, and that’s what I like most about what we do. We take positional conversations about water and make them collaborative. It’s also incredibly fun to go to work every day and do something you’re passionate about. One of the biggest things for me is the WaterSMART team’s passion for what they do. That’s a real joy. People have different attitudes and needs when it comes to water, but water knows no boundaries or politics. Nor can a silver bullet solve all its challenges everywhere. This is why water is so perfect for curious people; it’s always on the move and always challenging you to find answers. Dr. Mayank Goyal won the 2016 Outstanding Leadership in Alberta Technology Award for improving the outcome of stroke patients. 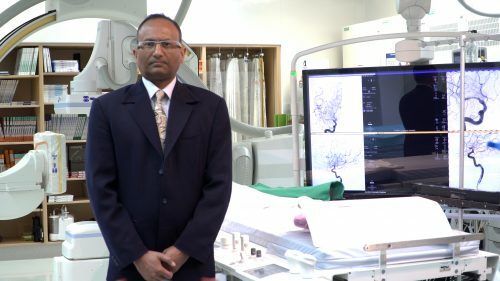 His latest innovations, the multiphase computed tomography angiogram (mCTA) and the Brisk Recanalization Ischemic Stroke Kit (BRISK), are vastly improving stroke treatment. Innovation does not happen overnight. Over the last 10 to 12 years, I have focused my life on producing the research into how the brain vessels work, and then how to optimize diagnoses, workflow, procedures and how to open the vessel fast. We work to improve patient outcomes. One of the big limitations was the imaging. You do a CT scan to figure out if the patient is having a stroke and to find the blockage. It was taking too long. I was struggling to come up with an idea to make the imaging procedure faster, and make it easier for residents and fellows in training to diagnose things faster. That’s when I came up with the multi-phase CTA. It was implemented in some of the largest trials around the world and has been used in at least 50 centres. The old method would sometimes take upwards of 20 to 40 minutes to diagnose a stroke. At our facility, we can get the imaging done and have a diagnosis in about five minutes. It makes it very easy to make a decision and move on to the next step. Our team is focused on making stroke care better around the world. Recently I was in Australia and I went to eight different centres to help them optimize their stroke care. Last week I was in India. That ability to influence change around the world through research and innovation is a very satisfying part of my life. I was always a science and technology kid. To come up with relevant and useful ideas, it took years and years of experience and understanding of the subject, identifying a problem, and coming up with a solution. I tell my students, “if you want to do it the easy stuff and come up with the structure of an atom, you needed to be born 200 years ago. All the easy stuff has been done.” We are left with the not-so-easy stuff. When I was in medical school, I was most interested in the brain. I felt like it was the last frontier, in which we have the least amount of understanding. I was inspired by my peers, who shared the same passion. We have a super strong group on the stroke team, and I’m proud to be part of it. We all push each other, and all perform at a very high level. Building the right team and surrounding yourself with intelligent people who are passionate about the same things is a really important part of success. 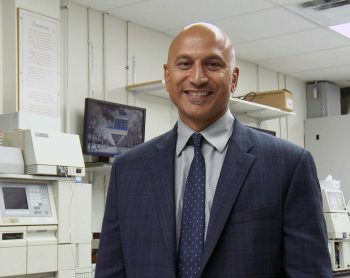 Dr. Christian Jacob is the director of the LINDSAY Virtual Human Project, which won the 2015 Innovation in Information and Communications Technology Award. The LINDSAY team uses virtual imaging technologies to help teach human anatomy in new and exciting ways. Growing up, I wanted to become a Latin teacher. I liked Latin as a very algorithmic language, almost mathematical. I moved to Calgary in two stages. In 1996, I was looking for someone working in plant simulation because I did my PhD in plant growth programs. We would see how a tree grows, or how the petals fall off flowers and then combine it with an evolutionary program. 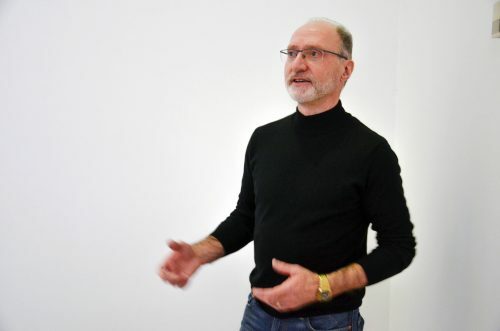 I connected with a graphics prof at the University of Calgary and that brought me here as a post doctoral fellow. Then, the computer science department had openings which brought me to U of C in 1999 as an assistant professor. I was just going to try it out for two or three years to see how I liked it. I really liked the university and the colleagues; it was a young department and I found some good research projects. That’s why I stayed and why I’m still here. I’m not a typical computer scientist; I’ve always looked at the computer as a think tool and nothing more. I was first interested in biology because of the brain. I did my diploma thesis on building artificial neural networks. I wanted to know how neurons work, how the brain works and how much of this can be transferred to computers as think tools, to help classify patterns and understand speech. Eventually I got into simulating immune systems. Suddenly I was inside the body and looking at physiology and how the immune system reacts to viruses and bacteria. Then an offer came to start this LINDSAY Virtual Human Project which led me to work with medical students and researchers. I’m a very graphical person: I must see and illustrate things. The constant development of technology has always fueled my interest in computer science. 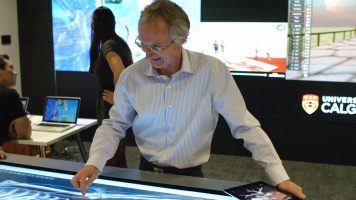 It went from different user interfaces where there’s just a mouse and a keyboard to touch screens and portable iPads that could react to my input. When we ventured into 3D, we could put these augmented reality glasses on. Now we can literally enter digital worlds; and bring virtual worlds, that are trapped behind the screen, into the real world and combine them. All this technology innovation helped create the things I only imagined we could do a few years earlier. With the LINDSAY Virtual Human Project, there’s always an opportunity to build the next prototype. Suddenly I had a project that was integrated into a medical school, and I had to really pay attention to the details regarding medical education, human physiology and anatomy. It’s still being used to train medical students at U of C, which is really cool. I also get to work with a lot of awesome people from other disciplines outside of computer science, including medical educators, physiologists, medical doctors, physicians and the artists and designers who make the program look good. That’s changed my life as a scientist, being on that inter-disciplinary side of computer science. The Giant Walkthrough Brain added to that. Jay Ingram is a fabulous science communicator and working with him was a great experience. I had to rethink how to present content from a stage, not for an expert audience. Now we had to consider music, stage lighting, a script and we had to set up this giant walkthrough brain with hallways and signs, like a movie set. As a scientist, that was very exciting because I learned how to sell my science. We explained to people how the human brain works and then we told stories through the computer tool. This has changed my perspective on how to sell and promote science. I’m excited to venture even more into story telling, especially around the human body; people learn well through stories. Now computer games are the vehicles to create engaging stories. In the end, I hope I can keep inspiring students. This week we introduce Chris Micetich, president and CEO of Fedora Pharmaceuticals Inc., which is the 2015 Outstanding Commercial Achievement in Alberta Science and Technology Award Winner. The small remote pharmaceutical team leveraged success into a $750m sale for life-saving drugs. When I was a kid, I knew my father was a scientist but that was all I knew about his career. When I got to university, working in my father’s lab as a summer job, I started to understand more of what he was doing. It wasn’t until I joined him to create a new company and work alongside him that I truly understood the magnitude of his work. My father invented a drug called Tazobactam, which is a beta lactamase inhibitor. It combines with an antibiotic to make that antibiotic more effective. He suffered a stroke in 2005 in Los Angeles and while in a coma in the hospital, he developed a lung infection. Under normal circumstances, this would kill any patient it effected. With my family all present, the nurse told us not to worry because they had this miracle drug called Tazobactam. I told the nurse that my father invented that drug. She didn’t believe me. But after confirming it, she posted articles about him everywhere. They called him Dr. Taz for the remainder of his time there. I am passionate about a lot of things, including creating new drugs that will save lives. I also enjoy mentoring entrepreneurs to help take their business to the next level. I never really had an opportunity to pursue that passion until recently. My first year of university was in Science specializing in chemistry. It’s ironic that I really didn’t enjoy chemistry, but I’ve been running a chemistry-based company for 30 years! I joined my father in 1987 to help him start up a pharmaceutical company and I haven’t looked back since. Since that time, I’ve founded six different companies including the most recent, Fedora Pharmaceuticals. In 2010, when we were looking for a new discovery program to chase, I had my team focus on a new beta lactamase inhibitor that would potentially one day replace my father’s drug. We came up with something found to be much better than Tazobactam. I spun the project into a new company, raised money, advanced the drug into the clinic and then signed the largest licensing deal in Canadian biomedical history to Hoffman-La Roche. Phase 2 clinical trials are underway and all is looking promising. We hope to see our drug on the market in due course. It was very rewarding for our team that was involved in that deal, particularly since some were also involved in the discovery of Tazobactam. Discovering a drug and going right through development to market and then save lives is incredible! We take great pride in that and there’s not much more you can ask for in this industry. Taking an early stage program that originated in my head, convincing a research team to buy into the vision and then convincing people to invest was not easy. All along the way, we had way more nay-sayers than yea-sayers. It was a very difficult but rewarding experience to convince people to buy in to what we were trying to accomplish and then actually deliver. I hope before I retire to discover and license another life-saving drug for a big pharmaceutical company to take to market. This week we introduce Jessica Luc. A Finalist for the 2016 Leaders of Tomorrow award, Jessica divides her time between medical studies, non-profit organizations she founded and entrepreneurial pursuits. Find out what’s keeping her from pursuing a career as an astronaut. My path to medicine was not a straight one. I was a really ambitious kid and for me there was no limit – I actually first wanted to be an astronaut so I could venture outside Earth and make discoveries to benefit the human race. However, after travelling to Disney World and going to the Experimental Prototype Community of Tomorrow where I tried the astronaut simulation, I knew deep down that I was not built for G-force swirls and turns. Motion sickness settled in along with a twist in my career goal. I have always been a curious person and believe that one new idea — or new twist on an old idea — could launch us to the next level. Creativity and fear cannot co-exist, so I compete only with myself with the objective of being better today than I was yesterday. 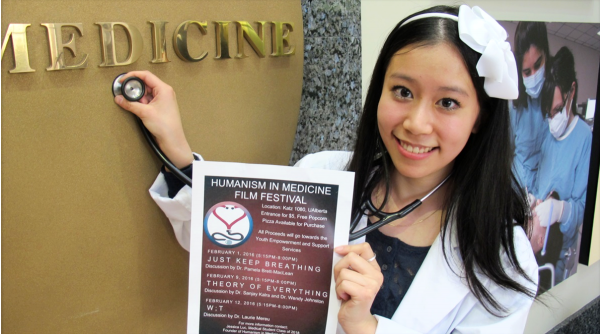 Because I am passionate about science and the arts, pursuing a medical career means I can tackle humanity’s greatest challenges and hopefully affect social change. The research I am doing is focused on ex vivo organ perfusion and its potential to preserve, resuscitate and repair damaged donor organs for transplantation. I spend hours and hours in the research lab and I fail nine times out of ten. But I believe that all these failures have taught me that you cannot fail unless you quit. I believe that we “try again, fail again, fail better” as Samuel Beckett said, and setbacks are simply set-ups for comebacks and opportunities to learn and grow. I have been a victim of bullying and having a good friend with eating disorders, so I co-founded a non-profit organization called Be Your Own Kind of Beautiful. Our motto is “Be (You) tiful”. Our goal is to raise awareness about eating disorders and bullying while we deconstruct society’s perceptions of beauty. We aren’t victims of circumstance, but rather our inner world determines our outer world. We ultimately have the power to create our own opportunities and happiness. I hope that I am able to make circumstances better for those who come after me. I also teach piano and mentor other budding individuals interested in medicine. Despite likely never overcoming my motion sickness to make it to space, I continue to enjoy opportunities to effect change in the space industry. Working with a multidisciplinary team, I am part of the AlbertaSat initiative at the University of Alberta. We built a nanosatellite that was launched into space by NASA to conduct research experiments. I am also passionate about 3D printing and I am part of a medical makers’ community to produce 3D printable medical supplies for affordable healthcare in remote communities. The fact is the discovery of a truth in an unrelated subject could easily be transferred to a current problem, as there is a certain level of relativity and relationship to the order of things. I believe that everyone should reach for the stars while keeping their feet on the ground. None of my accomplishments would have been possible without my parents, supporters and mentors who believed in me and gave me a chance to fly. Announcing three newly sponsored awards! 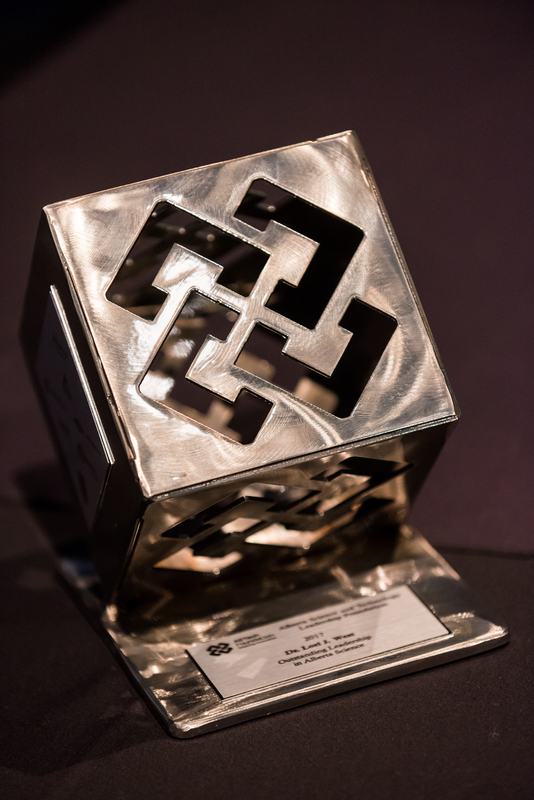 The ASTech Awards recognize the innovative achievements of remarkable individuals, companies and organizations who have made significant impacts in Alberta’s science and technology community. The ASTech Awards are possible because of the generosity from our industry and institution sponsors. New this year, NAIT has stepped-up to sponsor three awards, the Outstanding Commercial Achievement in Science and Technology Award, the Outstanding Leadership in Alberta Technology Award and the JR Shaw School of Business at NAIT is providing sponsorship for the Outstanding Science and Technology Start-up Award. We would like to thank the other five sponsors who have continued their long-term commitment to Alberta innovation through the ASTech Awards. Thanks to SAIT, Dow AgroSciences Canada Ltd., TELUS, Syncrude Canada Ltd., Alberta Economic Development and Trade and NAIT, the 2017 ASTech Awards will invest $80,000 back into the Alberta science and technology community through cash prizes. To submit a nomination for the 2017 ASTech Awards, click here. For the next eight weeks we will post a story about from our ASTech Award Winners and Finalists. Students, professionals or anyone looking to become inspired by the people behind the work can check out Humans of Alberta Innovation each Wednesday. This week, meet Glen Kathler. 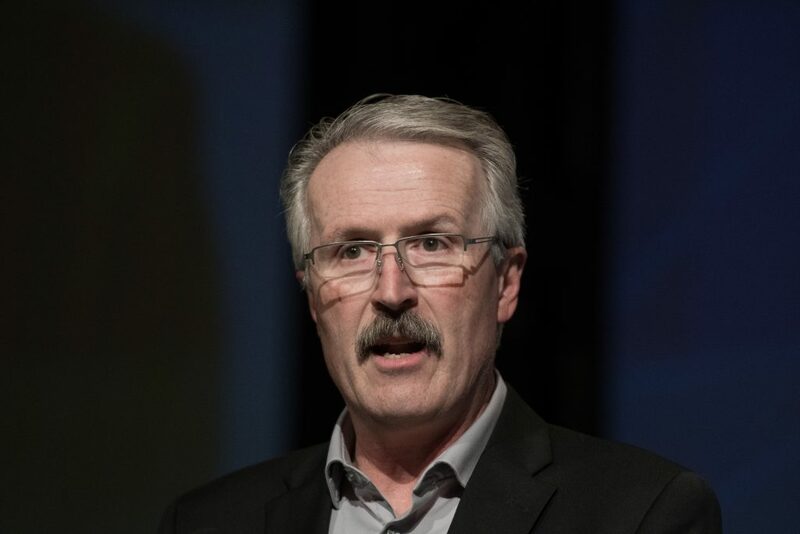 The 2015 Winner of the Innovation in Agriculture Science Award, sponsored by Dow AgroSciences Canada, tells the story of of his childhood fascination with taking apart and rebuilding electronics and how it led to him innovating Radio Frequency Identification in the Alberta cattle industry through his role as SAIT’s RFID research lead. I’m not afraid to go where there are no footprints. My glass is always pretty much half full. In my line of work, it’s always like, “Okay, it’s not that I can’t do what you’ve asked me to do, but I just haven’t quite figured out how.” I am always looking for a solution to a problem. I’m not afraid to go where there are no footprints. It’s definitely not a very linear path to success. I’ve always been a pretty good listener, so when someone describes a problem they’re having, I’m not in a rush to tell them, “this is what you have to do.” It’s more of a “here are some of the solutions we should look at.” Sometimes, there literally are no footprints. One of my jobs as a young technical fellow was to drive the snowcat up the mountain in the winter to do repairs at radio sites. Most of the time, you could not actually see where you were going; it was foggy, snowy, maybe a blizzard, but you still had to get there. From the time I was knee-high to a grasshopper, I’ve always been fascinated by the opportunity of solving problems with technology. I was probably seven or eight years old. My dad was a radio and television repairman in his spare time, so there were always things for us to take apart. There was no shortage of large electronic equipment that he wanted for spare parts, and he said, “I’ll pay you to take them all apart”. I realized as I started taking them all apart that I knew how they went together. Suddenly, it was like, “I could actually build something!” By the time I was eight or nine, I had built an AM radio – which may sound kind of antiquated – and an actual burglar alarm out of spare parts. I scared the daylights out of my mom with the alarm, because it was designed to prevent anybody from coming into my bedroom unannounced, and it just so happened that she was the first. I did not grow up on a farm but I lived in small farming communities in southern Manitoba. I have a love for the outdoors, so when the opportunity to work in agriculture came along, something immediately resonated. I am passionate about technology, and through certain opportunities, I’ve gained a passion for Alberta agriculture. Right now, I’m working on tracking animals and locating and identifying them by using drone and RFID technology. I love being paid to do my hobby. I have a business card from around 1983; it said: “The Innovators.” Innovation for me is a way of life and I’m very passionate about the research. At ASTech our mission is to identify and celebrate outstanding achievements in science and technology in Alberta. We accomplish this through our many events, which are only possible because of our generous Sustaining Members. Increasing awareness of Alberta innovation is a big part of how we celebrate science and technology through our annual ASTech Awards and NextGen Innovators Showcase. In order to support our mission, we recently installed a brand new sign in the Innovate Calgary building. 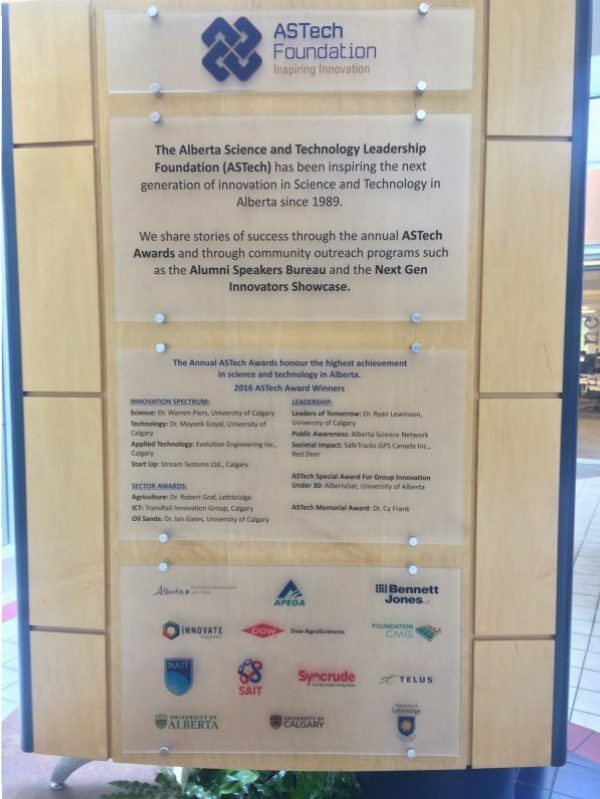 The sign features information about the ASTech Foundation, our ASTech Award winners, and our Sustaining Members. Placed in the heart of the Innovate Calgary lobby it will be seen by hundreds of innovators and industry professionals every day, and will increase awareness around Alberta’s innovation leaders.